Sometimes when you are blogging you get small treats such a peek at a new cookbook before it hits the shelves. 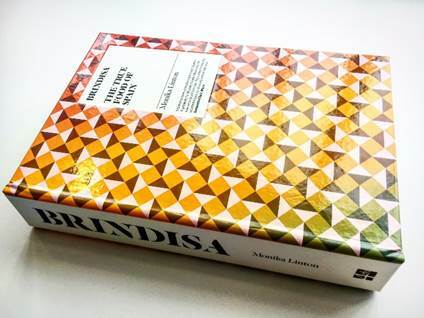 This was the case with the new Brindisa cookbook, where I received a sample chapter and a couple of recipes. Written by Monika Linton, the force behind the bars, restaurants, delis, and on-line shop, this is a beautifully written book explaining the use of ingredients, how they are produced and when to use them. The chapter I was sent focussed on Sherry Vinegar, and I was fascinated to learn about its production and the whole host of variations that I hadn’t appreciated previously. My appetite whetted, I had to try one of the recipes. I opted for Arroz caldoso de alcachofa, guisantes, sepia y gambas. For non-Spanish speakers that’s Soupy rice with artichokes, cuttlefish and prawns. Many of the pages were crossed referenced e.g. to the recipe for the fish stock, so the version I made was a Tuesday night cheat version using cupboard ingredients such as tinned artichokes, Essential Cuisine fish stock, pre-cooked squid (thank you Ocado!) My apologies to Monika! Heat a ridged griddle pan, spray with olive oil and cook the artichokes until they have some colour on each side. Set aside. Heat the oil in a large pan and add the shallot and garlic, then the tomatoes. Cook on a low heat for 10 minutes, until the onion is soft but not browned. Add half of the fish stock and saffron, bring to the boil, then turn down the heat and simmer for 3 minutes. Add the peas and the beans (mine came straight from my garden and were so tender that they didn't need skinning). Then add the rice and the remainder of the fish stock, and the artichokes. Cook for about 15 minutes. Finally add the prawns until they turn pink, and the squid tubes. You really don't want to overcook the seafood. The rice should still have a little bite to it. If you have a passion for Spanish food, the cookbook will be available from 8th September.